"Two people who hated one another should not be buried next to each other, for even in their death they will have no peace together." How do Kabbalah and Chassidus elaborate on this phenomenon of two people continuing their dispute even after they are no longer alive? I do not know anything about this halacha, so I asked my rebbe and I'll share the answer he gave me with you. He said that he didn't read the halacha literally, that the two people would literally keep fighting if their graves were near each other. Rather, he viewed it as more of an issue of kavod hameis. Normally, the proximity of graves is a matter of kavod for the two people and it might imply some connection between their neshamos. On the flip side, it would simply not be bekovodik to place someone's grave right beside one whom he hated. We have heard stories that refer to this like the story of the Miser of Krakow. When Reb Shimon, a lonely miser, was niftar, the Chevra Kadisha decided to give him a buried plot befitting his miserly nature. They buried him at the edge of the cemetary, by himself. A week after the miser's death, the Rav of Krakow noticed that many of the poor people suddently began coming to him for help because their anonymous benefactor had stopped assisting them. He put two and two together, and realized that it was Reb Shimon, the miser, who was supporting all of these poor people. 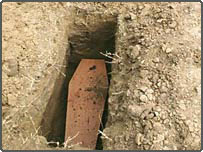 At his death, the Rav asked to be buried by the lowly grave of Reb Shimon, "The Miser." It is apparant from such stories that if two people are fitting together and a "good match," so to speak, then it is a kavod to both of them to be buried side by side. Now before I continue the story, I must tell you what I and perhaps some of you thought the answer was going to be. I thought they were going to call their burial plot real estate agents, complain and get their plots moved so that they would not be side by side anymore. However I was wrong. The fact that they were going to be next to each other was their impetus to make shalom and end their long-term emnity once and for all. All of the chevra in the Beis Medresh made l'Chaim and everyone was very happy to see that sad chapter between them end. If anyone out there knows anything about the mechanics / Kabblah / Chasidus of this halacha, I would also be interested in learning more. Lurker: I am glad you finally stopped lurking and started commenting! :) Your comments are indeed insightful. It's so weird you told the story about the Miser of Krakow. I was just this morning reflecting on an old co-worker, now deceased, who had a really terrible reputation at our school. People were cold to her even after it was clear she was dying of cancer. I knew from sharing a classroom with her that she was a person with a giant heart who just had really bad social skills. The lion's share of her income from her second job went to poor families at the school. She'd literally outfit their homes for them- sheets, towels, clothes, TVs microwaves, medicines, bicycles, mattresses, etc. She kept a desk full of food to feed hungry kids. So we really never know, do we?